A few months ago, I had the opportunity to honor Lily in another beautiful way by participating in something called "The Sacred Project." I first heard about this project last summer when several pages I follow on Facebook shared about it. All the participants knew at first were the guidelines to submitting a photo and that it was to honor and remember our babies and the bond we share with them. 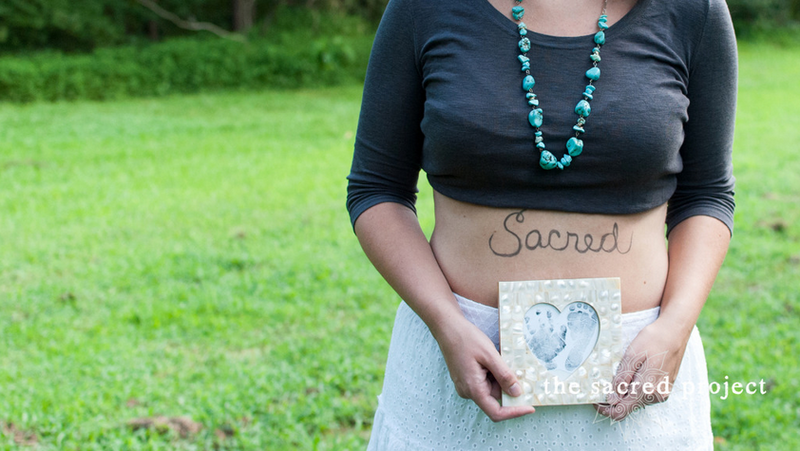 "The Sacred Project was created to provide an opportunity for mothers who have experienced the death of a baby during pregnancy or infancy to create something delicate & bold in honor of their child. Filmmaker Pia Dorer, of It’s Not All Black & White, and Sweet Pea Project’s founder, artist/writer Stephanie Paige Cole, have teamed up to create a new project that will raise awareness and unite bereaved mothers from all across the world. 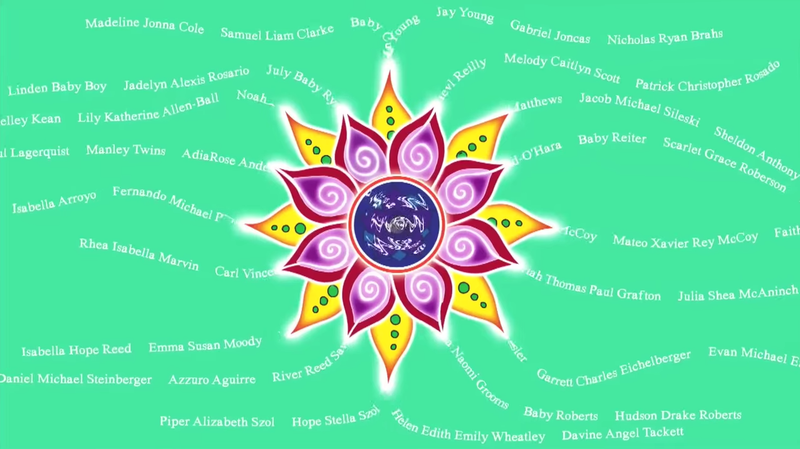 Based on Stephanie’s poem “sacred” from the recently released poetry collection To Linger On Hot Coals, the Sacred Project aims to honor the bond shared by mother and child. The short film is a global artistic collaboration that will contain stunning visuals from our 498 contributors, sound clips in 18 languages, video in multiple languages, original music from musician/song-engineer Ian Aeillo, motion design from Ulrike Kerber of Viva Design, animation by Aaron Shiel and original art from both Carly Marie Dudley of Project Heal and Stephanie Paige Cole of Sweet Pea Project." "Stephanie’s powerful poem ‘Sacred’ has comforted bereaved mothers around the world and has been the inspiration for our film project and the advocacy work surrounding it. 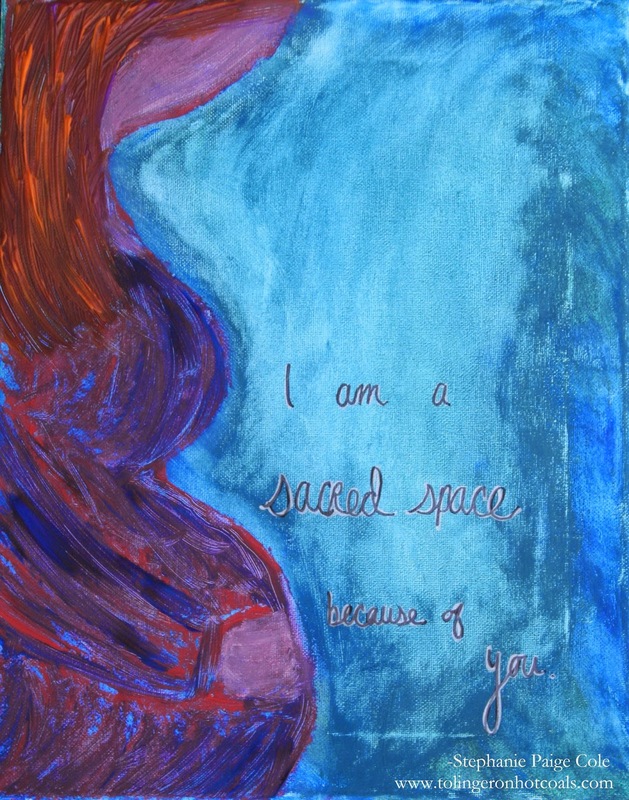 Although Stephanie’s poem was written in memory of her much loved daughter Madeline, who was born still in 2007, her final words “i am a sacred space because of you” continue to resonate and unite ALL mothers. It irrevocably acknowledges the special bond that is shared between mother and child that can never be broken – even following loss." My sister helped me with my photo. I decided to hold a heart frame with Lily's hand and footprint. All the photos submitted from mothers around the world are so unique. You can see the gallery by clicking HERE. I was happy to hear that some of my friends were able to participate in honoring their baby because I shared about the project last summer. Here is a beautiful painting that Stephanie Paige Cole created, inspired by her poem. I think the film is beautiful, to see hundreds of women, representing hundreds of babies, from around the world, with different accents, backgrounds, etc. Yet, we are all bonded by the love and grief for our babies. It is a powerful visual to see so many photos together. I was disappointed that I can barely see my picture in the video and wish they could have flashed each photo, even for just a second. But I understand that there were just so many that it would make it difficult to do that. I also wish I had sent an audio clipping in for the project, but when I received the email about it, I was busy that day and by the time I could have done it, they were no longer accepting audio clippings. Here are the screenshots from the video where my picture is (towards the top and a little over to the right from the center). I loved seeing Lily's name at the end, at the beginning of when the names started. There it is on the left towards the top. I must admit that as beautiful as I thought the film was, I did get a "buddhism tone," with the mandala and some of the music. I know that I'm not the only one who got that feeling. I don't like that aspect of it and had no idea it would be that way. But other than that, I really like the film. On the website, there is a page called "We are sacred spaces because of" and then Lily's name is listed. By the way, if you've lost a baby, you can add their name to this list by visiting the page. I feel honored to have been a part of this project and am so happy I could honor my baby girl in yet another way. The Sacred Project has a Facebook page if you are interested in "liking" it.